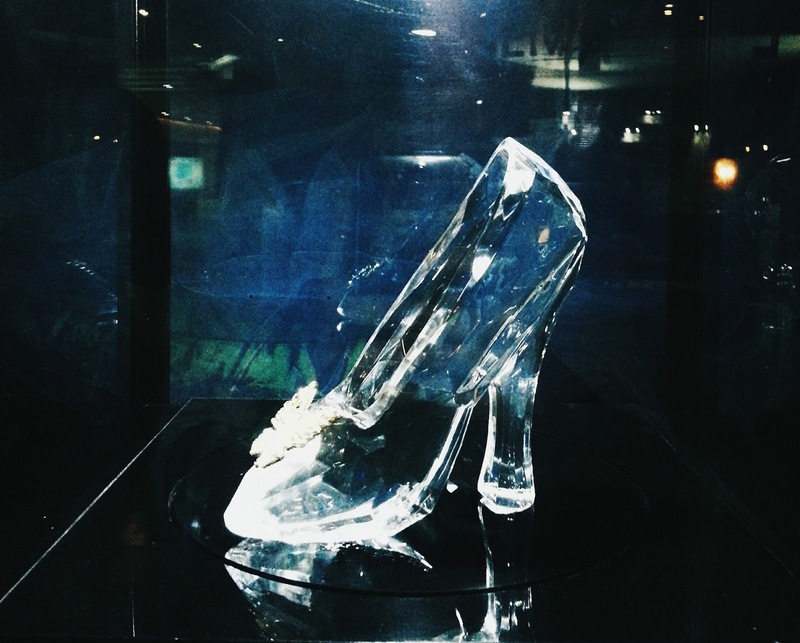 This photo of the glass slipper was taken at the entrance of Premiere cinema in SM Mall of Asia. With the dark hall leading to the cinemas, this revolving display of Cinderella's most iconic symbol was stealing everyone's attention. Ironically, the live action adaptation of this fairy tale from the 1950's may have been visually polished but it declines to be remembered as a film about shoes made of glass, or the majestic chanting of "Bibbidi Bobbidi Boo" by a pompously-dressed fairy godmother. The lessons can never be clearer: courage and kindness. The retelling of Cinderella's plight, from being in a happy family to being an orphan and from doing household chores to marrying the hopeless romantic Prince Charming, went very straightforward. The vibrant visuals made from the marvelous production and the stunning costumes provided magic. The most powerful spell, however, was reserved to remind us to honor our parents even beyond death; for parents to guide their children with unceasing love; to try to understand why evilness exists and to be patient to people who are stroked by it; and as told by the dashing Prince Charming, to follow your heart. Meanwhile, it was an easy task for Cate Blanchett to be the most memorable character knowing her caliber. But while the stepmother confused us on how we should feel about her by portraying a sophisticated wickedness, Lily James' representation of Cinderella is soft but not naive, kindhearted but not sentimental. Not mainly because she transformed into her gorgeous blue ball dress with glitters on her cleavage but because she chose to not be afraid. Her first encounter with the Prince at the woods was both feisty and flirty, wasn't it? Lily's execution was also marked with subtle bitchiness. Remember, how she walked out of her stepsisters' room when they quarreled when one of them broke the tiara? Her smirk was feminine but yes, it was still a celebratory smirk. Of course, we are all proud of her when she responded to her stepmother in French that left the latter and her stepsisters dumbfounded. The major portion of bitchiness has to come, as expected, from the stepmother but it was too difficult to hate Blanchett. I was distracted maybe by her amazing gowns (11 costume changes in total), but her elegance is amusing rather than annoying. Even her deep, throaty laugh is lovable and who could not forget how she turned around to show her face when she first entered the house of Cinderella's family. Blanchett and the screenplay's team-up reminded us that there's a reason behind every evilness in this world and that we need to discover that to be able to forgive. It would be too early to have Cate Blanchett expect for an Oscar nod for Best Supporting Actress but there's no way we can forget Sandy Powell and her knockout costume-designing talent. It might be expected, noting that Powell won three Oscars already for Best Costume Design (Shakespeare In Love in 1999, The Aviator in 2005 and The Young Victoria in 2010) but I still had endless wows everytime Cate appears on screen with a new dress on. All of the pieces were obviously made to let every detail shine, from well-cut sleeves to the tiny sequins on the bodice. As what the movie's writer, Chris Weitz, said in his storybook narration, "She too knew grief but she wore it wonderfully well." As beautiful as Cinderella's almost-living blue ball gown are the pretty establishing shots of the forest and the sprawling palace grounds. The breathtaking production design gave the fairy tale a genuine feel, making the kingdom appear to be somewhere in Europe. I can imagine how most young girls would say that it was the exact palace they had in their minds when they first listened to Cinderella's story. The visual effects was flawless too. The critical transformation scene of the pumpkin into a carriage, the rats into horses and the duck as a coachman was presented in detail. That moment when the duck was partially transformed into a human being with the huge beak still on his face satisfied our childhood imagination of how magic is done. And that it's actually a process if we recall how the lizards have their tales even a few minutes after the transformation. I was told by some friends that Cinderella's makeover scene needed a lyric song to highlight the drama but I say again that it was done just right. It was the only moment in the movie when realism was suspended. The location details were removed and replaced with waves of glitters, providing enough enchanting moment that a chorus of vocals will just ruin the film's pace. But I get it. Who doesn't want a theme song for a fairy tale movie? Ellie Goulding's modern recording of an original song "My Blood" is rightfully played at the credits. With how tangible the movie was presented, can you still describe the fairy tale as something silly? Or as something that only young girls would believe in? It was colorful visual showcase of platonic and romantic love and a lecture for us to never stop believing in courage, kindness and occasionally... a little bit of magic.